My reaction to their “these are not the droids you're looking for” attempt was to bypass it. Heck, I haven't even installed IE7.... but then again, why should I?.... I never use the IE6 that I do have. Yeah, I just installed it 2 days ago on the Laptop & the PC. IE6 was so horrible that IE7 which was average seemed amazing. (Maybe that is there marketing strategy). The scary thing is this: CSS3.0 and HTML 5.0 are starting to creep into existence and browser hell will begin all over again. In any case, even though I updated to IE8, I ain’t givin’ up Firefox 3, either. 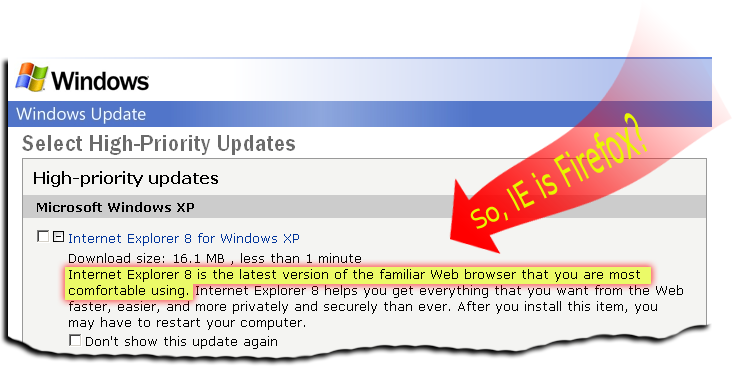 Apparently, IE8 now has a plugin system just like Firefox. While a good step towards a proper browser, it feels like a copycat. Hopefully, standards will be respected this time so I don’t have to maintain X versions of my HTML/CSS pages. Too bad people will still be using IE6 in 10 years. Makes it all useless. Mozilla won’t load/ save in MHT format, unless you search, try unusal, rare add-ins. IE will sometimes do this … very slowly. That’s why I use Opera Browser. If IE, then a use an Opera-type shell: Maxthon, Green Browser, or Avant Browser. Am I the only person on this planet who loads / saves MHT files?